While the work of Silver Spring Cares focuses on our immediate community, we wanted to take an opportunity to share the work of local super mom Pavy Bacon. Her family is a great example of a busy working family who supports local businesses and charities whenever possible. Her husband, Rick, works for Greater DC Diaper Bank and coaches for Takoma Soccer. She serves on the Board of Silver Spring Day School and volunteers for the East Silver Spring Elementary School PTA. These nonprofits help neighbors and strengthen community ties, and working with them has been a great way for her family to make new friends and to teach their children the importance of giving back. And then from the comfort of her own home, Pavy decided to creatively use Social Media to raise money to help organizations beyond our Silver Spring border. Tell us a little bit about Little Drops and what inspired you to create it? Little Drops is an online fundraising group whose members donate $5 twice a month to a charity selected by vote through Facebook. After the election, I felt compelled to take action and create the positive change I wanted to see in the world. I was part of a number of progressive Facebook groups and kept thinking about how impactful it would be if every group member contributed even just a dollar to nonprofits that are already doing great work. After suggesting this a few times, and no one taking the bait, I decided to try it myself. How did you organize/ask guests to participate? I started off by inviting my close friends and family, who then invited the people they knew. I also recruited members from other Facebook groups. People were itching to do good, and contributing $5 twice a month to a charity selected by vote was an easy ask. It eventually took on a life of its own, with dozens of new members being added every day from all over the country. Facebook had all the tools necessary to set Little Drops up easily. Facebook Groups is a great way to organize a large group of people toward a common goal, and Facebook fundraisers are easy to use, offer payment information security, one-click sharing, and visual goal tracking. I decided to set our donation level to the minimum supported by Facebook fundraisers ($5) in order to encourage wide participation by making Little Drops an affordable way to make charitable giving a habit. How do you select organizations? Little Drops is completely member driven. At the beginning of the year, we came up with a list of progressive categories/themes. On the 1st and 15th of every month, I pick from that list, and members nominate nonprofits that fit under that category. For example, when we focused on environmental groups, members nominated World Wildlife Fund, Sierra Club, etc. I then create a poll featuring those nominations, and members vote. At the end of the voting period, I create a fundraiser for the nonprofit with the most votes. How much do you typically raise? How much so far? We typically raise between $2,000 and $2,500 every donation cycle. Our minimum donation is $5, and our average donation is $14. We have raised a little over $53,000 so far this year and our goal is to raise $60,000 by year-end. How can people join Little Drops? People can join Little Drops by joining the group via this link: https://www.facebook.com/groups/mightyocean/ and taking the pledge to donate $5 twice a month to a charity selected by vote. I am doing it again! Members insisted on continuing in 2018, and I am more than happy to oblige. It’s a relatively easy lift for me and the results have been inspiring! I just want to add that I love the work that Silver Spring Cares is doing to highlight the work of local charities. Every time I feel discouraged about something I see in the news, I remember that there are people working daily on the front lines to make the world a better place, and all I need to do is support the great work they are already doing. Silver Spring Cares is making finding and supporting such organizations super easy, so thank you! Aw, shucks! You’re making us blush, Pavy! Thanks for being a Super Hero! 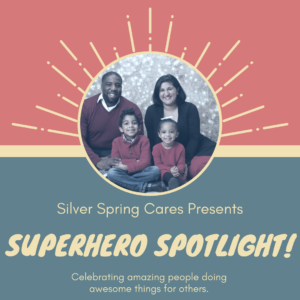 Do you know a Silver Spring Superhero? Let us know! Email heather@silverspringcares.org today!